In supporting a good friend in an online film series, Ithaca Studios gets to add a new logo design to its portfolio that will travel through various social media. Follow Black Girl Single at www.facebook.com/BlackGirlSingleTV with the logo as the Facebook cover photo as well as in this teaser trailer on YouTube displaying the logo at the end. On September 28th Indiegogo website will host Black Girl Single at www.indiegogo.com/at/BlackGirlSingle where fans can support the production of the online film series. Added to the portfolio is Ithaca Studios' first t-shirt design. 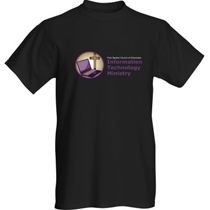 Approved by the ministry leads at the First Baptist Church of Glenarden, this t-shirt carries the logo of the Information Technology Ministry on the front and catchy phrase iServe @ FBCG on the back. The shirt is for members of the IT Ministry to wear at functions representing their passion, support, and service with First Baptist Church of Glenarden. To see the design displayed front and back visit the portfolio publishing section for labels. The T-Shirt can actually be ordered via VistaPrint's website. So Ithaca Studios is capable of designing and developing websites to be responsive using the Bootstrap formula. With the guidance of UX/UI designer Irina Kuzes, the INCATech, LLC official website operates via Responsive Web Design (RWD). RWD is widely used on websites so that the display can adjust and function on mobile devices. In time the Ithaca Studios website itself will be using RWD to maintain its portfolio. Copyright © 2008 Ithaca Studios. All Rights Reserved.